Béchamel sounds like such a fancy sounding sauce! It is actually just the French term for one of the mother sauces of French and Italian cuisine and is really simple to make. 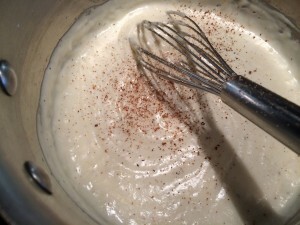 I was working in the kitchen recently with Brianna, when I was showing her how to make this moderately thick white sauce. Although it seems to have somewhat gone out of style, I recall eating a lot of casseroles made of “creamed” this and that. 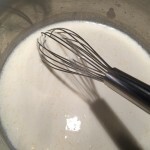 Many of the recipes we grew up on contained no actual cream at all; rather this simple white sauce that can be used as the backbone in simple and quick dishes many dishes including white Country gravy, such as the classic Biscuits and Gravy. It is the perfect start to Stroganoffs; and also the starter sauce for Swedish Meatballs. It can be used to prepare Scalloped or Au Gratin Potatoes, Casseroles or Pot Pies and it is also the basic to any “Cream of” Soups. 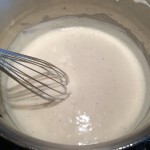 White sauces are usually built from a base of butter and flour, although in some instances, particularly when they are a gravy, they may be built up from pan drippings. 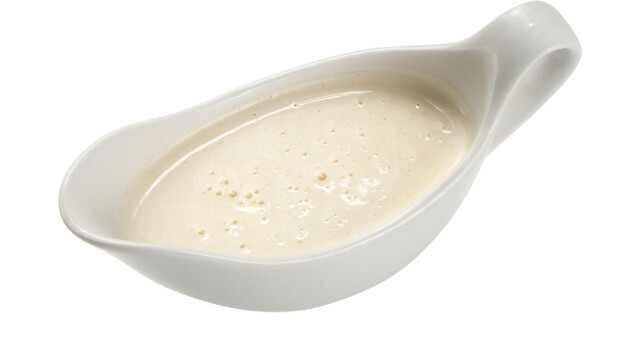 The foolproof way to attain a perfectly smooth sauce is to have the milk hot when added to the butter and flour. When you add cheese to a white sauce, you have created “Mornay” sauce. You’ll often see this as a base for Beer Cheese Soup and Macaroni & Cheese. 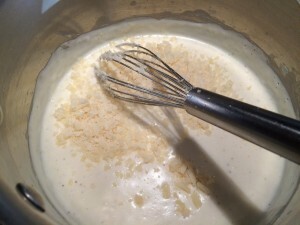 The classic recipe includes half Gruyère, half Parmesan; but any good melting cheese can be used. Melt the butter in a In a medium saucepan over medium low heat. I often saute a bit of chopped shallot or onion with the butter before adding the flour. Stir in the flour until smooth and cook, stirring constantly, until the paste cooks and bubbles a bit, but don’t let it brown. It should be light and golden color. Meanwhile, heat the milk in a separate pan on low just until bubbles begin to form at the edges, but not to a boil. 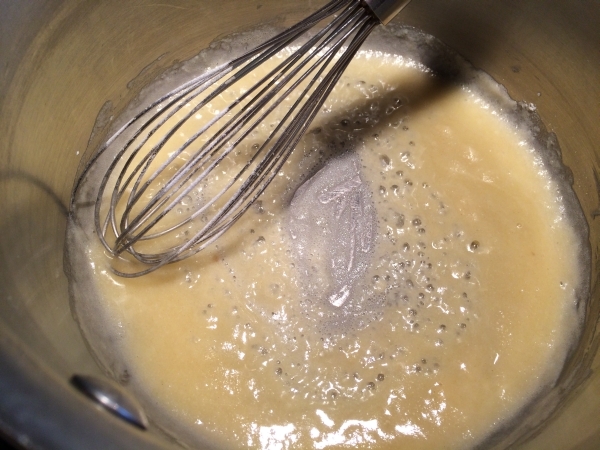 Remove from heat and add the hot milk to the butter mixture a little at a time, continuing to stir as the sauce thickens while whisking continuously until very smooth. 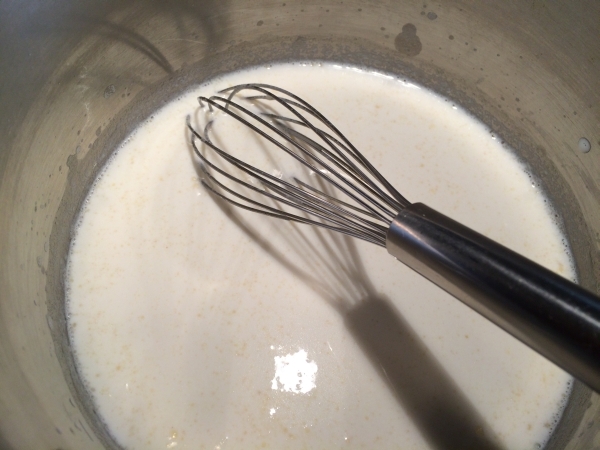 Some gravies start out with a white sauce, but stock would be used to replace some of the milk. Bring to a boil. Add nutmeg, salt and pepper to taste. Lower the heat and cook stirring for a few minutes more, stirring constantly, before removing from heat. If you wish to cool the sauce for later use, cover it with wax paper or pour a thin film of milk over it to prevent a skin from forming. 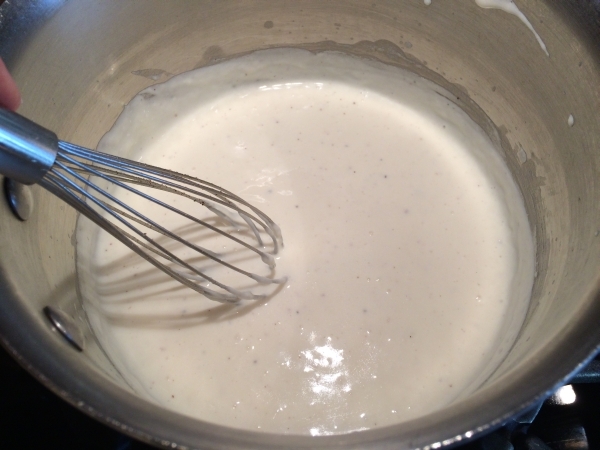 If preparing a Mornay sauce, cheese should only be added once the white sauce is finished. Turn off the heat and stir in very small amounts, whisking each bit until melted into the sauce before adding more. If the white sauce cools too much during this process, turn the heat under the pan back on to very low and gently warm back up. If you add too much cheese at once, or while the white sauce is too hot, it may separate and give an unappealing texture. You may also add a pinch of cayenne pepper if you choose. Use the sauce to create any of the mentioned dishes above.